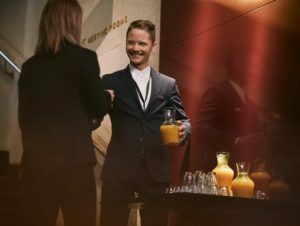 The concept will be launched between May 8 and 12 when 2,000 Scandic employees will meet close to 10,000 customers to inspire them to have better meetings. The companies have been invited to Scandic to test the new concept that has been created to meet the needs of Scandic’s corporate customers. In Scandic’s work to develop its meeting concept, more than 2,000 customers and arrangers of meetings were asked what important to them. More than half think that their meetings are ineffective today and nine out of ten managers consider meetings to be an important success factor for their organizations. There is also a demand for receiving support based on their meeting needs, achieving the right energy level in the meeting and making implementation easy. With this as a starting point, Scandic is now offering tailored solutions and advice from the planning phase through execution and evaluation to improve customers’ meeting culture. – A meeting can create a big change – or be a waste of time. With our new concept and meeting advisors, we now have the opportunity to create the best conditions for effective, efficient and inspiring meetings. This big initiative has been developed together with our customers which is why it’s great to now be launching it in the Nordic region and Europe, says Thomas Engelhart, Chief Commercial Officer at Scandic Hotels. In cooperation with Hyper Island, Scandic is also now training meeting advisors on how to arrange successful meetings. The ambition is to have a total of 500 meeting advisors at Scandic’s hotels in the Nordic region and Europe by 2020. Meeting advisors will help companies have better meetings based on their purpose and goals: training, inspiration and innovation, among others. In addition to advisors, the meeting concept includes a number of other new features and services designed to meet the needs of the future. A new food and beverage concept has been developed to suit everyone, regardless of allergy or other preferences. There is also a Magic Box in each conference room for exercises to boost participation during meetings. Scandic has also implemented a variety different technical solutions to communicate with participants already before the start of the meeting. The concept also allows customers to choose from various ancillary services such as broadcasting and gamification. Rollout of the new meeting concept began in the spring and will continue throughout 2017. By the end of the year, the majority of Scandic hotels will offer the new concept.